← ReBlog: Are YOU drinking the Keratin Complex Kool-Aid? People with visible and invisible disabilities are often not only discriminated against, but far too often abused. Some of the abuse is from ignorance. Other times it is systemic and sometimes it is political. ME/CFS, FM, and MCS/ES are often overlapping conditions. Canadian diagnosis stats with more details are here or a simple chart is at the bottom of the page here. There are 3 dedicated clinics in Canada for diagnosing these conditions (and more, such as EHS). One is in Toronto (with a perpetual long wait list) and a new one just opened in BC with Dr Bested as the clinic director and was immediately overwhelmed with people seeking appointments. There is also one in N.S. 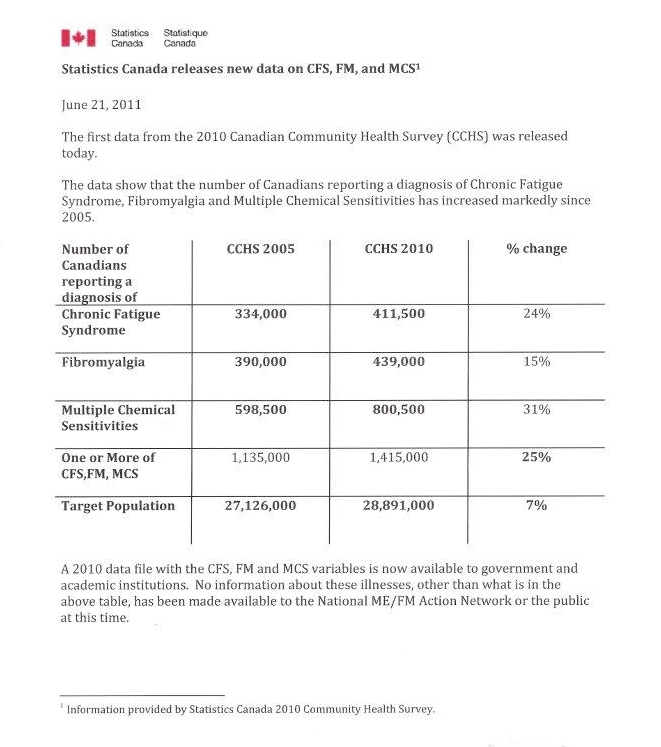 Some provinces have a diagnostic code for ME/CFS now, and for FM, but not for MCS/ES. The CDC has also recognized it. In the US, people can look for doctors on the AAEM website. (there may be others, I am not as familiar with the US resources). People in the UK and elsewhere are still trying to get proper recognition and protocols in place so that patients there are also not subjected to more abuse on top of these already devastating conditions. Watch the trailer of the film here, then you can link to the full length film from the Voices from the Shadows website. There is a lot of suffering due to these conditions, and very little safe and knowledgeable assistance to guide and assist affected people with what to do and what not to do in order to have as good care and quality of life as is possible. Better medical education, training and laws are required. This entry was posted in Environmental Health, Fibromyalgia, Health Care, Human Rights, Images, MCS/ES, ME/CFS and tagged documentary, environmental health clinics in Canada, FM, health, invisible disabilities, MCS/ES, ME/CFS, video. Bookmark the permalink. ‘Voices from the Shadows’ is available to watch online for free now.